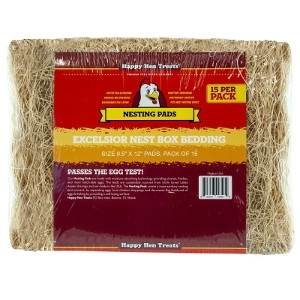 Happy Hen Treats® Excelsior Nesting Pads are a great way to maintain your nest boxes. Made from Great Lakes Aspen, our nesting pads help keep boxes clean by absorbing droppings and odors. They also help prevent eggs from breaking in boxes and make finding and collecting eggs easier. Happy Hen Treats® Nesting Pads works great in a 5 gallon bucket attached to the Happy Hen Treat® Nest Box Bucket Kit! Nesting Pad Dimensions: 9" x 12"